The first time I remember having a hot toddy—a warm alcoholic beverage used to warm and heal, what’s better than that—was at an Irish pub in Amsterdam. For my whole trip there, I had a massive head cold. During the day I wandered the city, using what little brain power I had to not get lost, and at night my ex-pat friend and host Collins took me to his local, Mulligan’s, where his bartender friend made me the best medicine I’d ever had; only then would I felt human. I drank hot toddies while sick in Ireland, in the friendly village pub, Connolly’s, in Scotshouse, County Monaghan. I’ve tried to recreate these, when I’m sick at home. Here’s my current recipe. Serve and enjoy. You may need to drink several of these. Thanks for the info, Shari. That’s what I heard was BS, that local honey helps with allergy resistance. It doesn’t seem like BS to me; I wish I could remember the actual reason BS was called on it. Agree. But apparently this mostly applies to raw honey – when it’s been heat-treated (pasteurised, or even maybe put in boiling water) then the proteins are broken down so they won’t have the same effect. Or so I heard. That’s probably how the BS call came in. Glad to have this clarification, thank you. I seem to remember a fairly recent news story that much of the honey in the grocery store may not even really be honey at all – apparently it was mostly corn syrup. One more reason to avoid the chain stores. Where I live we have lots of Amish farms with local, raw honey for sale. That is what I usually get. I have also ordered the honey from Tropical Traditions. It is very good too. I remember hearing about that, too. Yikes! Spending a few extra bucks for the real stuff, and to know where it comes from, is definitely worth it. Raw honey still has live probiotics which also support strengthening the immune system. (*Manuka honey from NZ is especially an high probiotic source) Stir in the raw honey when the hot toddy has cooled just a bit (under 104 F/40 C) for a probiotic boost. Good to know; thank you! Well, can’t say I enjoyed your expletive, but did appreciate the rest of the blog. When my daughter at age 2 had the croup, was in ER about to undergo her 3rd round of adrenaline (they thought she was having an asthma attack), an old doctor walked by, said she had the croup, and to give her a hot toddy which consisted of whiskey, lemon and honey. She did NOT like it, but it was the only thing that brought her breathing back to normal We would use this several more times through the years for her until she decided she liked it. At that point we declared her cured! Just kidding. It has been a real life saver! I have been giving my family and myself this fabulous toddy for the past fifteen years. I wish I could remember where I ever came across the recipe but I do remember that the first one called for brandy and maple syrup to sweeten. That is what I still favor. It has always been my thought that if you are heating your raw honey you are definitely losing at least some of its benefits as enzymes and some vitamins, especially C, are ruined by heat. 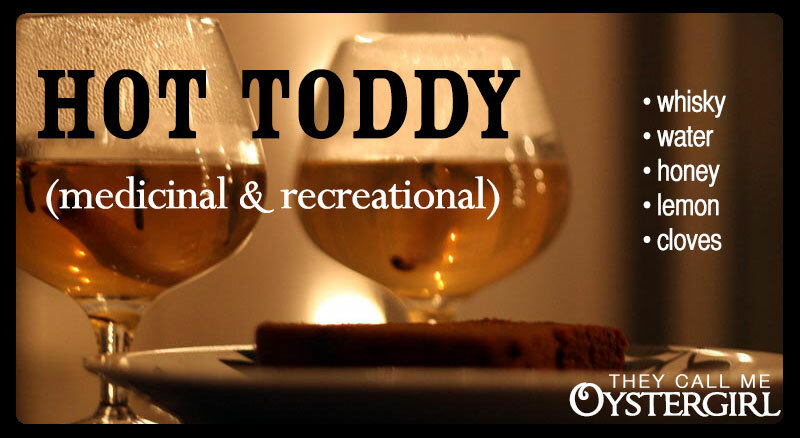 That may be one of the reasons why I prefer the maple syrup but I also like the taste better in this toddy. I think maple syrup comes with its own healing properties as well. So, I tend to use honey in unheated preparations like this: http://nancyvienneau.com/blog/articles/home-remedy/ …and maple syrup in hot ones.